Season 2 of Australian Ninja Warrior is fast approching!! So as well as some great nights in on the couch watching the show.....it also means that auditions for season 3 of the world wide phenomenon will be opening soon too!! Do you think you have what it takes to attack the Australian Ninja Warrior course? Want to start training for the auditions? Our founder and head trainer here at Perfect form fitness training is @savageninja_ash, Season 1 competitor on Australian Ninja Warrior! Ash has built a great Ninja course here at our facility which is totally adjustable for all fitness/skill levels. Balance, core strength, grip strength, speed, agility, physical confidence and mindset training are all necessary for not only performing well on the course, but also for making a good audition video. Ash has the skills to set you on the path to success in all these areas. So if tackling the Ninja Warrior course is a dream of yours, or maybe you just want to feel what its like to fly through the air knowing confidently that you can catch your body weight on the other side, then contact Ash to book a session today!! Perfect form fitness training encourages all of it's members to get out of their comfort zones and get involved in local events. For this reason we created the Perfect form SAVAGES!! Here is a photo of our savages after running obstacle hell, a 5km obstacle race. For many of our members this was their first obstacle race and everyone got muddy,conquered fears, got a great workout and had an awesome time working together as a team to surpass all obstacles. Congratulations to Coral Symonds for representing Perfect form fitness training at the ICN Miss Athletica Competition!! Coral's hard work and dedication paid really paid off with her receiving a 2nd, 3rd and 4th placing over 3 figure categories. Coral always pushes hard with her weight training, keeps her meal planning on point and stays mentally focussed on her way to competition. All training, meal planning, posing practice and spray tanning was done in house at perfect form fitness in our Capalaba studio and the end result- Coral looked absolutely amazing onstage!! Check her out!! Perfect form fitness training is excited to be able to add kids Ninja warrior and Calisthenics (body weight) training to our list of available services!! We love fitness and are always learning new skills, in 2016 our trainer Ash completed his Progressive Calisthenics Certification and early 2017 he will be one of the athletes in the brand new television show "Australian Ninja Warrior". This style of training is a great way to get your young ones interested in fitness, we work on strength, coordination, flexibility, new skills/challenges and most of all having fun!! Each week we look at progressing up the ladder of calisthenics exercises and each week we have a new ninja warrior set up to tackle. Call or email Ash for pricing and details, your kids will love it!!! 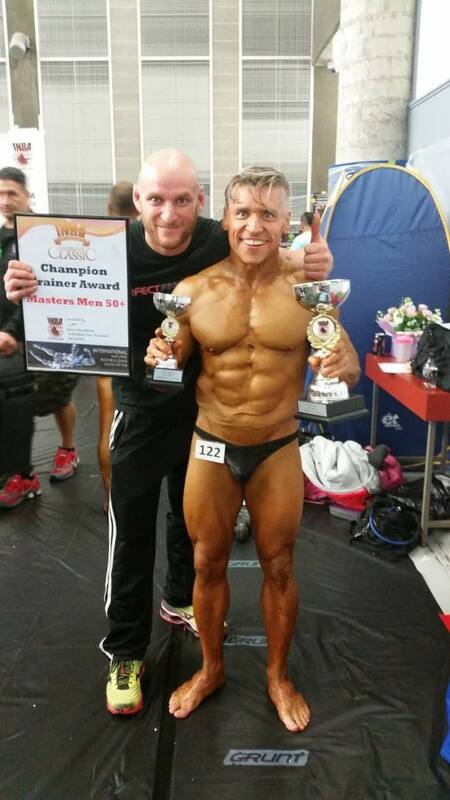 Peter Russell repesented Perfect form fitness training well at INBA Queensland Titles at the weekend. His months of hard training and dieting paid off getting him into 3rd place on the podium in the 50+ men's bodybuilding catagory. It takes a strong mind and alot of disipline, sticking to a meal plan, training hard everyday and getting the required posing practice in to get in this kind of shape. Great work and congratulations Peter!! Our trainer Ash headed down south for Sydney's first ever PCC course (Progressive Calisthenics Cert)at the weekend(sept 23-25th 2016). This course is run by Dragon door's world renowned Master PCC trainer Al Kavadlo! Al was joined by his lovely wife Grace Kavadlo and the CEO of Dragon door Mr John Du Cane. The word Calisthenics comes from early 19th century Greek: Kallos 'beauty' + sthenics 'strength' and teaches the student in a totally progessive way, from the most basic moves which can easily be performed by the beginner, right up the ultimate feats of unparalleled strength such as the Human flag, Muscle up and many more using little to no equipment. Benefits Include: Strength, Muscle gain and weightloss. Al and Grace put on an amazing weekend, everyone participating in the Certification loved it!! This Certification is a great addition to Ash's qualifications and puts him at the top of the pack when looking for a calisthenics trainer in Queensland. 2015 We held a 1 minute rowing challenge between all our awesome clients throughout the year. There was tough competition with each and every client bettering their times over and over again, proving that their Cardio fitness and strength improved as the months went on!! The final results were taken on the 11th of December. Our winner for the females was Anna Afoa with a distance of 306 metres in 1 minute!! And our Male winner was Tyson Dixie with 347 metres in 1 minute!! Unbeleivable times Anna and Tyson!! Great work!! Success at INBA 2015 QLD Titles!! Team Perfect form fitness training had great success at the 2015 INBA QLD Titles at the weekend (26-27th Sept). First up we had Mr Peter Russell placing 1st in the 50+ Men's Bodybuilding. Ash placed 4th in a tough Men's Bodybuilding line up and received 2 Champion trainer awards. And on sunday we had Matty Kearney taking out 1st place in Men's fitness 1st timers, 5th place in Men's fitness open, made the top 3 in overall Men's Fitness, placed 2nd in Novice Mr Physique and 2nd in Mr Physique Open. Unbelievable effort from all three guys and a great result from the team overall!! New Outdoor Astro Turf Area!! 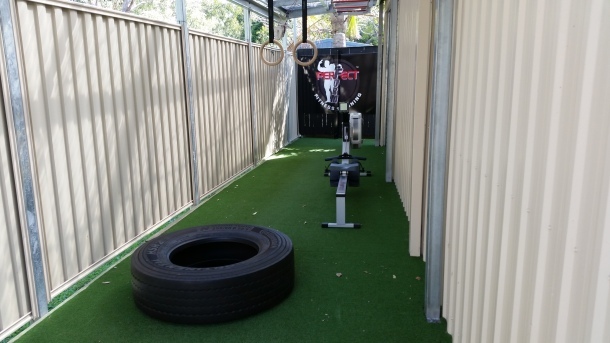 At Perfect Form Fitness Training we are constantly upgrading our facility, now with the addition of our new Outdoor undercover Astro turf Area the workout possibilities are endless!! Weighted sled runs, tyre workouts, outdoor boxing sessions, these are just some of the new capabilities this outdoor area has bought to Perfect Form Fitness Training. Stay tuned for more additions soon to come to our always growing facility!! Perfect Form Fitness Training put forward another Winner with Peter Russell stepping up at the INBA Brisbane Classic on saturday night!! After months of hard training, dieting and posing practice Peter came up with the goods Winning the men's 50+ Bodybuilding Catagory. This was Peter's 1st time on stage and he owned it!! Congratulations Peter you are a champion! Ash & Coral clean up at INBA Rookie Rising Star Comp in Melbourne! Last Sunday Ash & Coral travelled to Melbourne to represent Perfect Form Fitness Training in INBA's Rookie Rising Star Body Building and Figure competition. And what a day they had!! Ash Won Novice Body Building, Placed 3rd in over 75kg Body Building and Placed 4th in Overall Body Building. Coral did awesome work as well placing 2nd in her age catagory. Ash also received a Champion BodyBuilding/Figure trainer award for Perfect Form Fitness placing so highly so in so many catagories on the day!! Awesome outcome coming from all those hard hours training, dieting, dedicating their lives to fitness and proving once again that if your serious about your fitness goals, Perfect Form Fitness is where you need to be. December 20th 2014 was our first ever Top Performers Awards and was a great success!! A lot of places give out awards for short 8-12 week challenges where often the participants don't end up developing lasting good exercise and nutrition habits. These types of challenges can actually be a way of learning bad and unhealthy habits like yo-yo dieting and exercise. In this modern age of obesity, fast food and sedentry lifestyles, everyone is after a quick fix. There are no quick fixes!! Just hard work and determination!! So I decided that awards for notably changing not only a person's physique, but a more permanent exercise regime, better eating habits, a stronger mind and healthier lifestyle seen over a period long enough to prove they are the REAL DEAL would be better deserved. It was a tough decision with so many deserving people making great changes this year. The person who made the most changes to her life was.......Lisa Greig, who in 2014 lost 25kg of body fat, gained a heap of muscle and mental strength, gave up smoking and became a POWERHOUSE in the gym!! Second place went to Edith Cash who trained hard all year without faltering, and represented Perfect Form Fitness Training in her first figure comp at the INBA state titles this year, looking Absolutely STUNNING!! And Third place was Nick Carey who just 3 years ago was diagnosed with Burkitts Lymphoma Cancer, Nick kept a strong mind, pushed through all the obstacles and came to see me 18 months ago. He lost 10kg of body fat and gained a heap of muscle in 2014. Congratulations Guys!! Keep up the good work!! We look forward to seeing who will take out the Top spot in 2015!! Our Beautiful Coral was back at it again last weekend (21/9/14) at the ANB Queensland Championships. Coral was up against many of the same lovely ladies as the week before at INBA Queensland Championships so we knew we had to make some slight changes to place higher in this competition. A few slight tweaks to her diet and posing and Coral managed to come away with second place in her age catagory!! A great result up against some very tight physiques!! Awesome Coral!! Only 2 weeks till Nationals!! Perfect Form Fitness had two entrants at the INBA Queensland Championships at the weekend(14/9/14). Coral Symonds and Edith Cash Graced the stage with their Awesome physique's and beautiful posing entering 5 catagories between them. Both looked absolutely sensational, performing flawlessly infront of a full house at the chandler theatre. Coral managed to come away with a 4th place in figure masters and 5th in figure international. We are so proud of all the hard work these girls put in, the months of hard training and dieting takes a strong mind and a heap of determination, Awesome job ladies!! Bustin it up at Perfect form fitness's NEW studio!!! Our New studio is AWESOME!! Here we can accomodate all your training needs. Our trainer Ash entered into Lockdown 13-Grappling and Submission Competition on Saturday (29/3/14). He worked hard and came 1st in the Under 93kg Advanced division, winning the final via gillotine choke. Anyone in the Health and fitness industry who understands nutrition knows that there is NO REPLACEMENT for real food!!! Obesity is a growing world wide epidemic that all trainers and nutritionists should be taking VERY VERY SERIOUSLY!! Everyone wants a quick painless fix to weightloss these days-THERE IS NO QUICK FIX!!! NOTHING SUBSTITUTES a healthy meal plan with REAL FOOD!! There are countless meal replacements on the market today claiming to be a miracle cure to obesity, when the truth is these meal replacements are actually contributing to the problem. People need to be educated about healthy eating habits and made aware of all the preservatives in foods these days. To lose weight we need to steer away from take away and processed foods and train our minds and taste buds to eat as naturally as possible. Many of these products claim to cleanse the body of toxins and impurities, some even have the indorsments of great athletes.........Well here is the HARD TRUTH: Vegetables speed up the metabolism, provide us with necessary nutrients and cleanse the body which has been proven over decades to reduce body fat where as MEAL REPLACEMENTS SLOW THE METABOLISM DOWN!! STOP BEING FOOLED!! These are nothing more than an expensive YO-YO diets, so if your trainer or health care provider is selling you this RUBBISH they are lining their pockets with your hard earned cash; laughing behind your back while they count YOUR MONEY stolen through lies and empty miracle weightloss promises! Quick food fixes is what made you overweight, dont reach for another quick fix to attempt to reverse obesity.........Find a personal trainer/nutritionalist, someone who cares about YOU more than their wallet and get an individualised healthy meal plan based on fresh one ingredient foods. Call us today to book your session on: 0410278316 or simply go to the 'book my session' page of this website. Perfect form fitness training-servicing: Capalaba, Alexandra hills, birkdale, wellington point, cleveland, Thornlands, Victoria point, Redlands and surrounding areas. Perfect Form @ Super Spartan Race!! Ash & Coral had a great time at the Super Spartan race a few weeks back, pushing through the 15 gruellingkilometres much of which was in freezing chest deep creeks and waterways. They made it over/through all obstacles, finished the race in one peice and are now training hard for the next OCR event which is TOUGH MUDDER this sunday.